Fall Garland Maple Autumn Harvest LED Lights String by SILIVN. Description:This colorful lighted garland is perfect for doorframes, windows and railings and features 35 yellow lights. Operated by 2 AA batteries(not included). Great decoration for Christmas, birthday parties, weddings, gardens, rooms and other celebration occasions, both indoor and outdoor use. Package: Comes in a Beautiful Gift Box. Add a modern touch to your house with SILIVN now! Note:As for opening the battery case, you could please press on the upside of battery case, on the opposite of case with words of off/on,and push back. And then, you could put the battery in the case. If you have any question, please feel free to contact us any time! LOOKS LIKE THE REAL STUFF - The orange and yellow leaves lit by the vibrant orange lights make for a great blend of colors to warm up any room. Perfect festival decorations with no outlet needed. FOR BOTH DAYS AND NIGHTS DECORATIONS&Christmas Decor - In the day time, it will do its job being a string of maples. At night, the lighted LED on its string will accent any room and generate a warm atmosphere for any occasion. 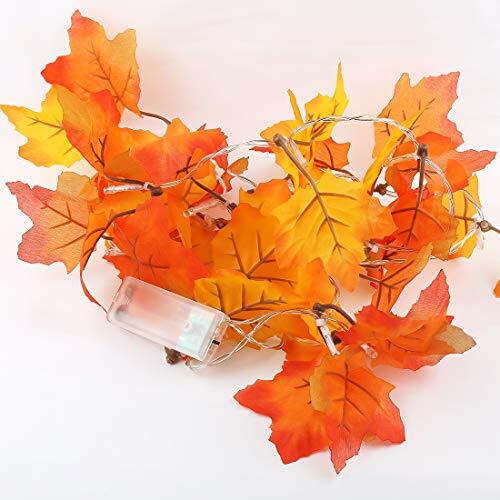 DECORATES ANY CONNER OF YOUR HOUSE - This lighted Fall Garland Operated by 2 AA batteries(not included). They will not limited by the power cords. Decorates table top, mantel, fireplace, doorframe, doorway, stair banisters, etc. DURABLE - This garland features a suitable length(8.2 feet/2.5m) for decorations. Bend and adjust to any shape that you like for your decorating needs. 100% CUSTOMER SATISFACTION GUARANTEE - Order this thanksgiving leds with confidence! The SILIVN 100% customer satisfaction guarantee means exactly that! We will fix any problems quickly and to your 100% satisfaction every time! We are always available to help our customers.